I recently came across an interesting book, The Hokasai Manga. Given Hokusai was born in 1760, he was certainly ahead of his time when it comes to a current definition of manga, although at that time it simply meant “sketches”. Sketches they certainly are, all 3,900 of them. 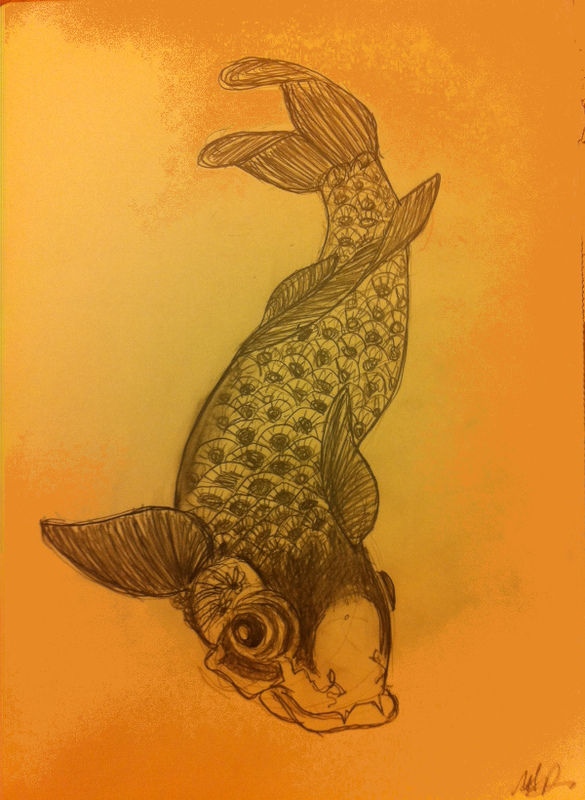 Here is a sketch of a carp I adapted from one of his works in the book (Gyoran Kannon). Beautiful eh? Talk about taking the long view.. makes a refreshing change to the 10,000 hour maketh an expert concept, which translates to about five full-time years. That would make one but an infant in Hokusai’s book! P.S. For more musing on these subjects, see an earlier two-part post – Flow, Meaning & A State of Grace. This entry was posted in Philosophy, Writing and tagged Gyoran Kannon, Hokusai carp, hokusai carp drawing, hokusai manga, hokusai meaning by simonandfinn. Bookmark the permalink. This comment certainly puts things into perspective. It did for me, that’s for sure!